Not strictly Plymouth news as such but an update on happenings elsewhere with our local operators. 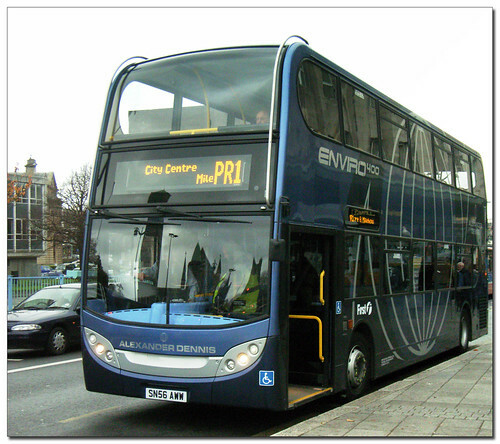 First Devon and Cornwall have announced that they are expecting 3 x brand new Dennis Trident / Enviro 400's low height are due for delivery in June for service X9 Bude to Exeter to replace the three 05 plate B7 coaches and hence provide improved capacity. Western Greyhound then announced that they have ordered 2 x brand new Enviro 400's low-height to replace the Volvo Olympians on 510. All these vehicles should provide a welcome and significant upgrading of the Exeter to Okehampton corridor. I think a day out will have to be planned for the summer when these enter service! Also the purchase of Truronian by FDC has now been completed after official approval was granted and buses are now appearing with First logos. Several ex Badgerline Volvo Citybus double deckers have been dispatched already where it seems the immediate need is to replace the ex London Olimpians which have been looking pretty rough for some time now. Other double deckers are also believed to be heading for Cornwall but no news on what these will be yet.